Bring your biggest and best ideas closer. You can do it all with the Ricoh MP 305SPF. Use this compact, affordable MFP to print, copy, scan and fax in small offices, construction trailers, libraries, kiosks, nursing stations and other locations where space is at a premium. You can even share information in larger documents, up to 11" x 17", without investing in and searching for specialized devices. One standard 250 sheet paper tray and 10 sheet bypass tray. Optional 500 sheet paper tray available for a maximum paper capacity of 760 sheets. Take advantage of the all-digital 10.1" wide Smart Operation Panel to move from one job to the next effortlessly. Create tailored workflows on the home screen by using shortcut icons for frequently used applications. Built in document server that has the ability to store up to 3000 frequently used documents. Who says staying ahead of the competition is difficult? It's easy when you can give customers the information they need - in multiple formats and multiple ways - quickly, with a host of standard security features. Perform everyday office tasks, including advanced printing, scanning, copying and faxing, from these versatile systems. Are projects piling up? Save time with preset shortcuts to frequently used document tasks. You use your smartphone every day. Why not use it to print documents from wherever you are? You can even monitor user activity and energy consumption remotely, and make strategic changes to simplify work and reduce costs. When you're up against deadlines, every second counts. Whether you're printing, copying, scanning or faxing, these systems help workers speed through jobs with flexible media handling and a choice of automated finishers. 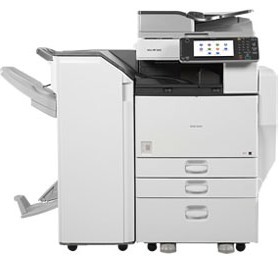 These systems offer quick print/copy speeds at 25,30 and 35 pages per minute respectively. When you replace individual devices with a multifunction printer, you save time and money by con solo dating tasks, supplies and support. More important, you can capture, manage, use and share information faster. These systems serve up your small office or workgroup with customized workflows, scan-to functions, support for mobile or remote workers and more. Even when your away from the office, you're close to the information you need to share with others. 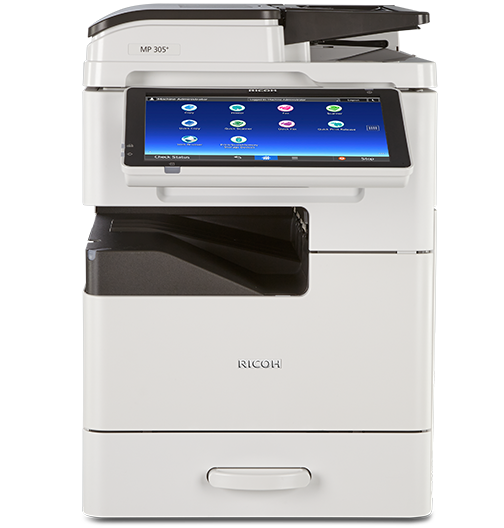 The MFPs integrate with Ricoh's optional HotSpot Enterprise, so you can print directly to an MFP. BE even more productive with the Ricoh Smart Device Connector app, which allows you to use the copy, print, scan and fax capabilities of the MFP directly from mobile devices. Scan your documents in black and white and colour. The high compression PDF function helps keep file sizes small while maintaining image quality. When you need to distribute hardcopy documents right away, use the scan-to-email function. Or, when you want to share and archive documents au ti ma tic ally, configure the scan-to-folder function or use the standard file transfer protocol. Skip the expense of multiple fax lines. Send faxes from a PC or use IP faxing to deliver information right away to conventional fax numbers. You can even route inbound faxes to an e-mail address or network folder to get information to a recipient quickly. What good is your information if you can't share it quickly and easily? With these Ricoh systems, you can speed up information flow with customized workflows, scan-to and print-from USB capabilities, shortcuts for frequent tasks and support for mobile printing. When you're up against deadlines, every second counts. Whether you're printing, copying, scanning or faxing, these systems help workers speed through jobs with flexible media handling and a choice of automated finishers. 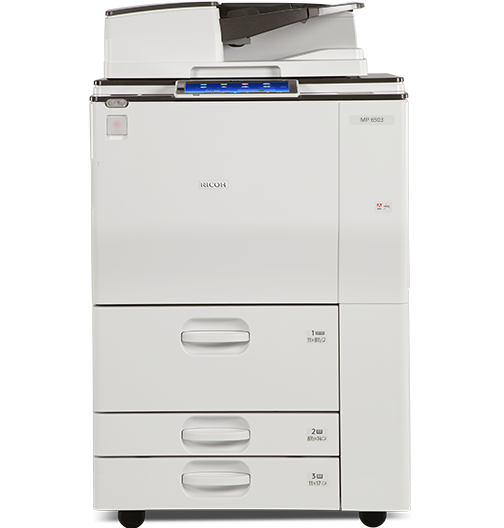 These systems offer quick print/copy speeds at 40,50 and 60 pages per minute respectively. Share information faster by using fa mil liar, intuitive smartphone or tablet actions with the optional Super VGA smart operation panel. You can simplify routine actions like printing, copying, scanning and faxing with motions like drag and drop, pinch and flick, and scroll by swiping. Remotely manage your printer fleet with @Remote. This internet-based tool lets you monitor your device usage, automate meter reads and toner alerts, and quickly alerts us of problems to shorten downtime and improve service. Do more in less time with the help of these high-speed multitasking MFPs - for example: Scan invoices to your mailbox, Print from a USB drive, Print important documents and fax them to coworkers or clients and copy monthly sales reports. Add watermarks and mask copy when unauthorized users try to copy documents. Make a bigger impression on your biggest of jobs. Complete bigger jobs even if you don't have the biggest budget. 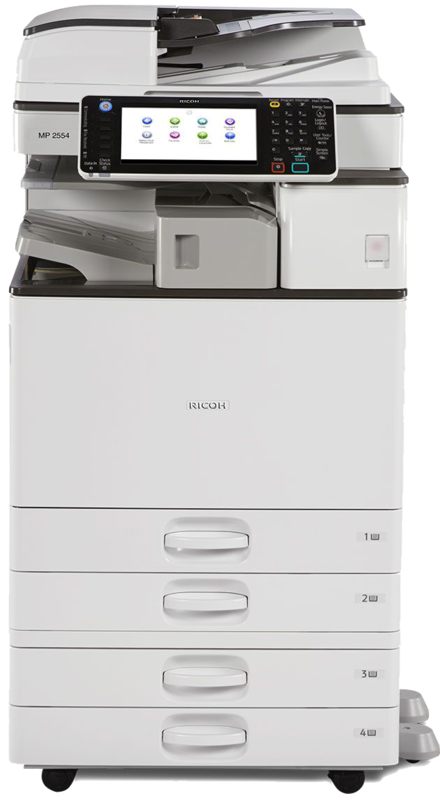 Create your own path to productivity with these Ricoh systems. Built with our Workstyle Innovation Technology, you can accomplish more high-volume tasks with less effort via customizable digital workflows, cloud-based accessibility, support for mobile users and more. The large 10.1" Wide Smart Operation Panel replaces hard keys with touchscreen precision. With the same movements you use on your smartphone or tablet, you can slide from one job to the next, download information-rich widgets, check settings and more with a single swipe, pinch, flick or drag. Equipped with a SD slot and USB reader for easy plug and print technology. Create customized shortcuts to frequently used tasks and skip time-consuming manual steps. Connect directly to print, copy, fax and scan functions with a single touch. Scan full-color originals and distribute them immediately with a host of Scan-to capabilities. Make sure that your information remains secure. Restrict access to the MFP to authorized users only. Have them sign in via passcode, or billing code on the control panel or by swiping an identity card with the optional NFC card reader. Print on the move without utilities, software or drivers. Download the Smart Device Connector app to control print, copy, scan and fax functions directly from your smartphone or tablet. Improve your finished documents with stapling,hole punching, stacking and a wide range of automated finishing options. Choose the one that fits your unique requirements and give every presentation a more professional appearance. With their innovative motion detection sensor, these systems wake from sleep mode automatically as you approach, so it's ready for your next job with little delay.